An internet search about South Indian food stalls in and around Delhi will give you a multitude of options to choose from. One can find a thela serving a range of South Indian dishes in almost every neighbourhood of Delhi or NCR. However, no amount of Google searches will help you find this place. But once in this neighbourhood, this food stall is hard to miss. 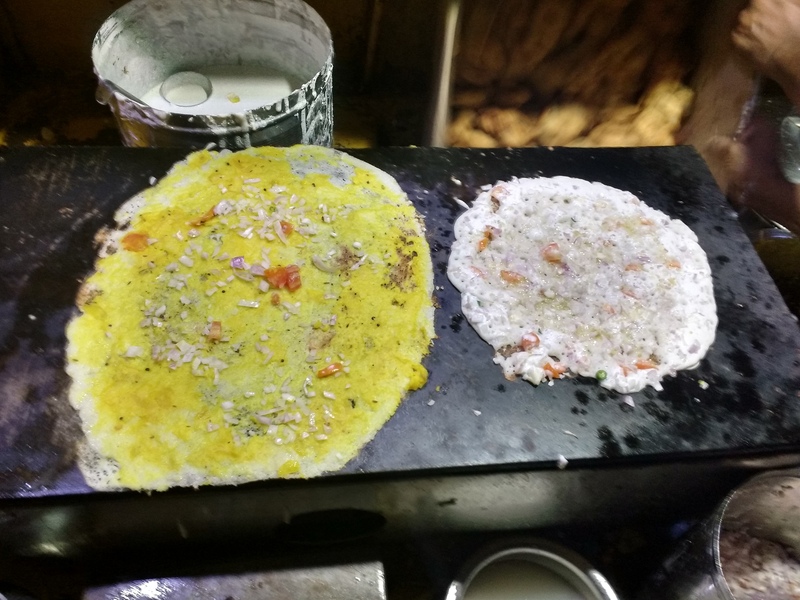 Angel South Indian Food better known as Raju Idli Wala, is a small food vendor located in Noida’s Sector 34 who is quite popular in the neighbourhood for making delectable dosas at an affordable cost. As the name indicates, he sells wonderful, light as air idlis. 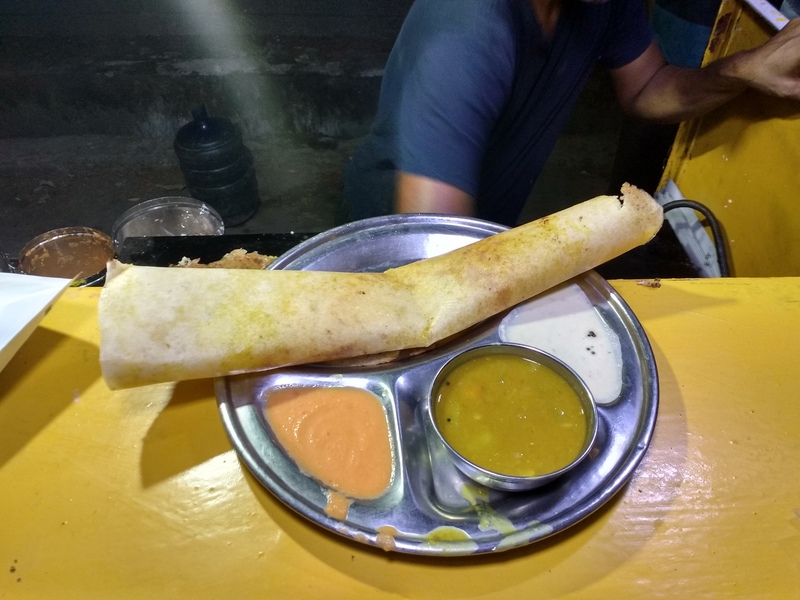 However, refusing to confine himself to just this, he also makes a range of South Indian food like Uttapam and Vadas and serves them with sambhar and delicious nariyal chutney, all at an affordable cost ranging from rupees 40-50. Raju, the owner and the head chef, sets up his thela at 6 in the evening and closes only when every one of his last customers has been served. He has a team of two who help him with the cleaning and the management of his affairs. Raju’s story goes as follows. Before being a small business owner, he used to work at an office canteen, making the very same things, until the company was shut down and he was out of a job. This was probably his wake-up call to do greater tastier things. 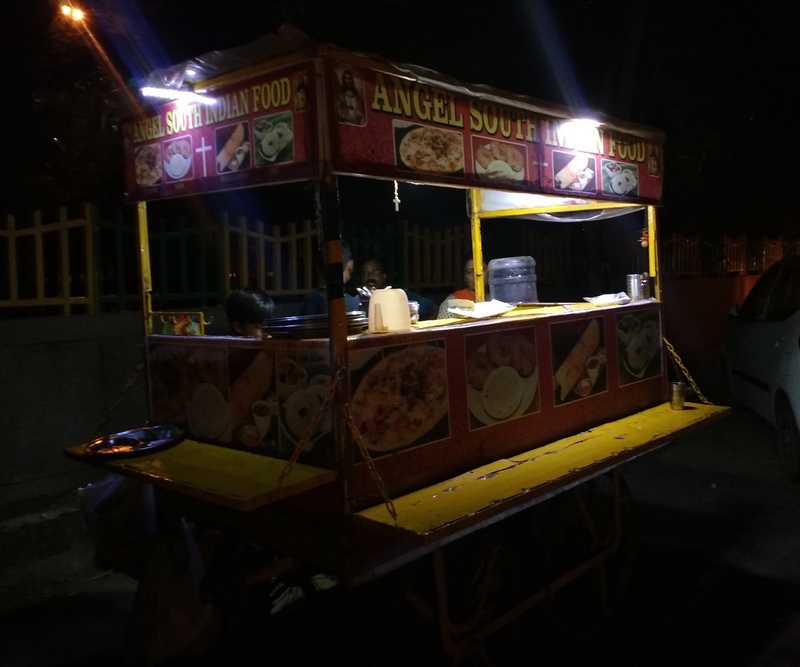 He named the food stall after his daughter Angel, but the shop is synonymous with his name. As soon as this place opens, it starts humming with activity, witnessing a line of hungry people all eagerly waiting for their order. Raju makes the best of what he has in order to accommodate them. The thela serves as a cooking station and also doubles up as a table. Everything, from the cooking to watching people indulge in the food is a visual treat. The option of “Take Away” is also available. But the locals say the food is more enjoyable and seems tastier when you eat it there, surrounded by fellow foodies. Raju Idli Wala’s thela is easy to spot, located opposite the B12 Market, next to a huge park, and close to the Wave City Centre metro station. This is a must try for the locals, and worth hopping onto a metro and travelling the distance, just to gorge on some delicious Vadas and Uttapams. So the next time you are in town, do not forget to grab a plate of your preferred South Indian dish at Raju Idli Wala.